Harris shares the 2018 Nikke Keddie Book Award with Orit Bashkin of the University of Chicago. 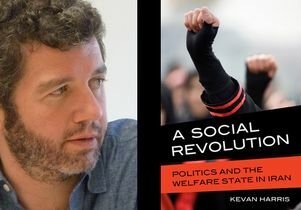 Harris’ book, published in 2017 by University of California Press, has won the Nikki Keddie Book Award and the Middle East Political Economy Book Prize. The Nikki Keddie Book Award, was created in 2017 in honor of Nikki Keddie, UCLA professor emeritus of history and historian of Iranian social history and women’s history in the Middle East. The Keddie Award honors exceptional scholarship in religion, revolution and/or society. The Middle East Political Economy Book Prize recognizes exceptional critical work on the political economy of the Middle East. The former prize is awarded by MESA and the latter, by the Political Economy Project of the Arab Studies Institute. Harris received the awards at the recent annual meeting of the Middle Eastern Studies Association in San Antonio, Texas. “It is a great honor, as well as a humbling experience, for ‘A Social Revolution’ to have been awarded two book prizes at the 2018 Middle East Studies Association conference,” Harris said. Read more on the UCLA International Institute website.